WASHINGTON (CNN) -- When greeting Judge Sonia Sotomayor this week, Republican Sen. Jeff Sessions of Alabama made sure to tell her something loud enough for the assembled reporters to hear. 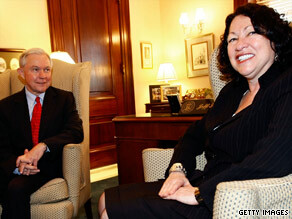 Sen. Jeff Sessions, the judiciary panel's ranking Republican, meets with Judge Sonia Sotomayor. "You will get a fair hearing before this committee," Sessions told President Obama's Supreme Court nominee with emphatic gestures and tone. That greeting wasn't just pleasantries. It was a promise born out of his own experience. President Reagan nominated Sessions to be a federal judge, but the Senate Judiciary Committee rejected him 23 years ago this week. He is now the top Republican on that panel. "That is a very odd thing," Sessions told CNN in an interview in his Senate office. "Somebody says it gives new meaning to the word irony." Talking about that irony brings back a flood of memories that he would rather forget. In 1986, Sessions was a 39-year-old U.S. attorney in Alabama. His nomination to be a U.S. District Court judge was troubled from the start because of controversy surrounding his prosecution of civil rights activists for voting fraud. Sessions' fate was sealed after Democrats called several witnesses who accused him of a pattern of racial insensitivity -- including calling a black lawyer "boy" and civil rights groups such as the NAACP "un-American." Sessions still gets visibly upset when he hears those charges. Democrats pounded him during his marathon confirmation hearings. Sen. Edward Kennedy, D-Massachusetts, was quoted at the time as saying he was "concerned about the racist remarks that Mr. Sessions has acknowledged that he made." Sessions now says, "That was totally distorted of what the reality was, and maybe he thought so at the time. He was getting some information from some very aggressive outside groups that were driving this entire message." He said, "It was hard to get my explanation out. Charges were thrown out, and then you'd try to respond and I just wasn't able to get the message out." The parallel to today, with conservatives such as Rush Limbaugh labeling Sotomayor a racist, is eerie. Because he is the lead Republican on the committee holding Sotomayor's confirmation hearings, Sessions will have a big role in setting the tone of the opposition. The story of how he unexpectedly got that position is wrapped in another irony. In 1986, then-Republican Sen. Arlen Specter crossed party lines to cast a decisive vote against the Sessions nomination. Until recently, Specter was the ranking Republican on the Judiciary Committee. It was only because Specter abruptly left the GOP and became a Democrat that Sessions moved up in seniority and gained such influence --- at such a critical time. "One of the things that was so gratifying to me recently was Sen. Specter, who when asked recently about had he made any mistakes, and he indicated that he has, and they said, 'What mistakes do you feel like you made? What vote did you cast that was wrong?' he said, 'Well, there was one vote I wish I hadn't cast that I'll tell you about and that was voting against Jeff Sessions,' " Sessions said. But given where he is today -- a senator since 1996 -- Sessions' motto is all's well that ends well. "That was tough. I got to tell you," Sessions said. "So to have the opportunity now to be in the Senate, to try to participate in a real high level of judicial confirmation process is something that I can only count as a great pleasure."